<em>15,000 Rosaries</em>, by Fictional Territories. <em>The Island of Bonemeal</em>, by Rachel Speirs. <em>X Mass</em> by Joseph Clement. Megan A. Skyvington, Ange-Line Tetrault, and Tara Lee Towers—the three members of the Womanking Collective. <em>Reflections from the Bottom Up</em>, by Bruno Billio. <em>A Common Thread</em>, by Quadrangle Architects Ltd.
Another view of <em>A Common Thread</em>, by Quadrangle Architects Ltd.
<em>Firesite</em>, by Tomas Rojcik and Andrew Lovett-Barron. The curators of the Gladstone Hotel’s annual art and design show, Come Up To My Room, are inviting everyone to, well, come up their rooms and check out the many wonderful and bizarre spectacles created by this year’s commissioned artists and designers. This year’s show marks CUTMR’s 10th anniversary. It features nine installations in the hotel’s second-floor rooms, and 19 other installations in other locations around (and outside) the Gladstone. The installations outside the hotel include what could be the most audacious item at CUTMR this year. In the courtyard of the Bohemian Embassy, a nearby condo building, people can find what is best described as a fur-clad jungle gym. It’s called Hyde, and it was created by Devon Thomson and Tess Millar. Its goal is to evoke a childlike wonderment. This year’s indoor exhibits include such quirky sights as Dwell by Womanking Collective. It consists of 27 small, wooden houses perched on the walls of room 204, each one filled with its own collection of objects or materials for the viewer to decipher. The exhibits vary as widely as the artists who made them. Self-taught artist Rachel Speirs created a simulated shipwreck on a little island. The installation is based on her own short story, The Island of Bonemeal. Quadrangle Architects made an installation involving many spools of yarn strung up, around, and out of a room, onto a balcony where it continues with a collection of streamers. This year’s show also has a green roof of sorts. Viewable from the large windows leading up to the second floor, it contains Christmas trees discarded after the holidays. Artist Joeseph Clement drove around in a U-haul for 3 weeks collecting them. On a wall in the hallway hangs Tara Keens-Douglas’ piece, Tapestry. Folded squares of craft paper are woven together into diamond shapes and wrapped with coloured strips, creating a rainbow gradient. 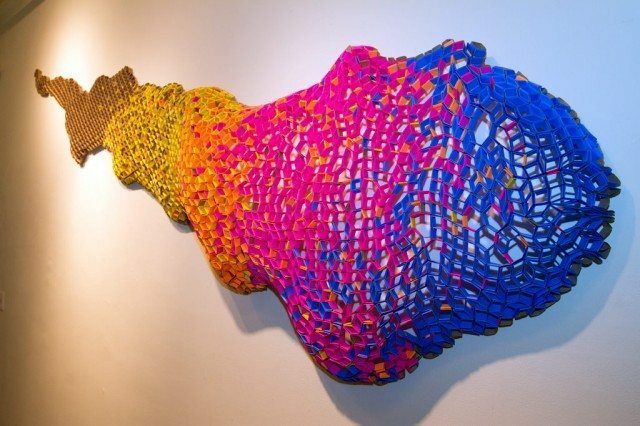 It takes on a wavy, organic shape on the wall, but she says it could take on whatever shape it needs to. “I made it flat on my apartment floor,” she says, in a Trinidadian accent. For a truly mind-bending experience, check out In All Falsehood by Gaston Soucy and Ruth A. Mora of the Sumo Project. A dark curtain sections off the room, which is illuminated with black lights. Passing through the curtain, the visitor encounters a large cube with mirrors on all sides of it and, coming around the side, finds a small walkway though the structure. Inside the cube, white rods glow under the black light and create the eerie feeling that what you’re seeing isn’t real. Soucy says the point of the installation is to mess with human perception. Suffice it to say, he’s done a great job of it. CORRECTION: January 25, 2012, 3:00 PM Because of an editing error, this post originally said that admission to Come Up to My Room is free. In fact, it’s $10.